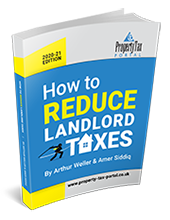 Property tax specialist Arthur Weller and property investor Amer Siddiq join forces to bring you the eleventh edition of this easy to read property tax busting guide - How to Reduce Landlord Taxes. What will the guide tell me? minimise your stamp duty payments and put more (a lot more!) money in your pocket! let you decide when it is the most tax-efficient time to sell your property. Accountants, financial advisors, letting agents and estate agents will also benefit from the information in this guide. Your book was a God send! I pay my accountants over 50k a year. They took your book away with them when I pointed out a few items that I thought would be relevant to my personal situation. You have potentially saved me over £100,000 in tax. I love your book and am grateful to its authors! I have read your book 'Pay Less Property Tax" and must say it is one of the best books that I have seen on the subject. It is down to earth with lots of practical real life examples and avoids all the jargon which one tends to find with other specialist books. I reckon it will at least save me in the region of around £40k in assessable CGT. Keep up the good work. Would just like to say a very big thank you......for the Tax Strategies. Being fairly new to property investment, they are absolutely invaluable to me. I was able to point out a few omissions from my tax return to my accountant. He was somewhat taken aback but I reckon I will get a more attentive service now that he knows that I know what I am talking about. Just by using one of the tips I am saving £6,840 every year! I've been dealing in property for 35 years. Over the years I have asked various accountants for advice and guidance. I have read all of the advice in Pay Less Property Tax and I have learned more in two days than in 35 years. Just by using one of the tips I am saving £6,840 every year! Order this guide now! beat the taxman and boost your property profits! We are offering the hardcopy version of this guide for £44.97 + £2.95 P&P.